3 Bedrooms, 2 Bath, Sleeps up to 10 + 2 kids. Located on the bluff with amazing views of the Long Island Sound around the year - This is our Waterfront Heaven. Set in a quiet neighborhood, the house is located on the bluff, about 85 feet above sea level. The house is facing the sea and the views are breathtaking. Conveniently located only about 1:20 min drive (60 miles) from Manhattan. 25 min. from the Hampton crowd. Weather you're coming to visit family in the area, attending a wedding / event at Inn & Spa East Wind Long Island (15 min. drive), Going on Vineyard Tour in the North Fork Wineries (20-30 min. drive) or simply want to enjoy the beach and the views, our house offers the perfect setting. (Our deck is now painted & renovated - not yet reflected in the photos). The beach in our town, along the north shore of long island, is one of the cleanest and most beautiful in the area. It is stretches for miles with no interruptions - true heaven for nature, sea life and birds. Views and scenery is beautiful around the entire year. Fishing, kayaking, sailing, surfing, swimming, bird watching, fly your kites....visit the nearby Wineries and Farms and much more. Watch the seals, cook in a fully equipped kitchen, play soccer or use the swing set for the little ones in the front yard, watch movies / YouTube / play games on our Smart TV and warm up by the fireplace in the winter....or just relax with a good book. Wake up and fall asleep with the sound of the waves. The Architect / Owner has renovated the house in 2007 and added a new house addition in 2014, separated by a door at the lower level common wall between the this rental unit and the adjacent one (Complete privacy is provided between the two units). This rental unit has a very functional open floor plan on the main entry level and another full level below it. The Living / Dining / Kitchen spaces are all on the main entry floor, opening up to a deck which wraps around the house - all facing the sea. The house interior is simply and beautifully decorated with clean and simple lines, still keeping the space airy and cozy. There is a full size Futon in the Family Room which can sleep additional 2. We allow for the use of blow-up mattress (to total 10 adults plus 2 kids + baby). There is sufficient space in the house for the queen size mattresses. If requested, 2 additional Queen-size blown-up mattress provided. Lower Level opens to a wooden deck and a sun tanning deck and a yard facing the sea. Large Living room with a Fireplace facing both the Family Rm & Master Bedroom. 1 Master Bedroom w/ a Queen size Bed, Walk-in closet, 1 Full double sink Bathroom, Washer & Dryer & Utility room. Upper Level (entry level) opens to an exterior wrap around deck which is facing the sea and includes: Living room w/ a Fireplace. Dining Area, Kitchen with island, 1 Full bathroom, 1 Guest room w/ a Queen size Bed, 1 kids room w/ a Crib, a Child bed and a Bunk Bed (Twin over Full - which sleeps 3), Swing set for kids at front yard, Walk-down to a private beach in a walking distance. Parties and / or events over 15 persons are NOT Allowed. Only 60 miles - less than 1:30 min. drive from Manhattan. Right on the beach with amazing views year round of Long Island Sound. All amenities included for both Summer and Winter rentals. Must be cleaned by the user/s. Firewood by renters. For 2 cars plus a 3rd parking shared with next door house. Additional parking is street parking. Family Room includes Ping-Pong Table, Smart TV (Netflix, YouTube, Games....etc. ), DVD player and play area. Many games available in the house both for young & adults. Spices, toilet paper and paper towels for a limited period. Full Kitchen appliances, pots, pans and serving dishes provided as well as spices. Dine In or Outside on the deck. Round table, chairs and umbrella are available for outside dining. We stayed at Shay's for 4 nights with three families and 4 toddlers. The house is spacious and kid friendly equipped with gates/toys/crib/toddler bed. The beach was a short walk away, a bit pebbly but quiet and calm water. Happy to hear that you enjoyed your stay! A house with solid potential but far too many many shortcomings to be recommended. Let's start with the positives -- views of Long Island Sound from the upstairs balcony and living spaces are gorgeous (downstairs views are impaired by foliage that has completely overgrown the fence). The house is also well-supplied with kitchen items. No complaints there. Beyond that, it's tough to know where to begin. Inside, the house presented a generally unkempt appearance. Our impression was that the owners built an attached addition and haphazardly stuffed their unwanted furniture, clothing, towels, toys, etc. into every nook and cranny of this non-favored side of the property. Appearances aside, renters have a right to expect minimum comforts. Such as pillows. There were pillow shams galore, but only two pillows in the entire house. Only one of those pillows was in a pillowcase on a bed. We had to dig to find a second pillow, and dig further to find a pillowcase for it. The rest of us had to use worn out shams, for which the owner made no apology. To the contrary, her response was "shams are pillows." Top sheets are also a reasonable expectation. There were none. Sleepers had to make do with a fitted bed sheet and a duvet cover. The tight 3-hour turn around between check-out and check-in provides little comfort that duvet covers (and pillow sham cases for that matter) could have been cleaned in that limited time. Quite simply, yuck. We don't need matching towels, although that would be nice. Unstained towels are a must, however. Couldn't find them here. Nor was there soap for the upstairs shower (although soap was promised), or a toaster or hair dryer (also promised). Towel racks that don't fall off the wall when a towel is placed on them and rods that don't come apart when curtains are drawn (Master BR) also are reasonably expected. A little preventive care could have kept these issues from occurring. A heavy rain Saturday morning brought with it major leaks in the skylight and sliding glass door upstairs. The skylight frame showed evidence of prior leaks. Luckily, we were home at the time and were able to use a 10-gallon pot to catch the skylight leak, and bath towels to absorb the door leak. The biggest issue was soundproofing between the two units, or, rather, the complete lack of it. We heard every note of every song and every word of every conversation in the unit next door. No doubt they heard us, too. Minimal added expense in the design and construction process would have lessened this intrusion. Vegetation obstructing view. The lower level veg. is landscaped and the grass cut once a week. We do not cut the lush veg. as it helps to keep the bluff stable and provides a good protective barrier for young kids who may play in the yard. Even w/ the vegetation, every room has water views. Availability of pillows/pillow cases/sheets. We checked the house after guest left and found enough pillows (over 12), pillow-cases and flat sheets for every bed and blow-up mattress. We apologize if she was not able to locate the extra materials. We had offered guidance to the guest where those materials could be found but did not hear back. The shams are reserved for the decorative pillows - not to be used for sleeping. Cleanliness. The house is thoroughly cleaned after each renter leaves and all duvet covers, sheets, pillow cases and towels washed. In the past renters did not use/want flat sheets and as such they were available in the closets but the beds were not made with the top sheets. Going forward, we make the beds with the flat sheets in response to the guest's feedback. Stained Towel, we apologize and have removed the towel. Our house is rented a lot in the summer and sometimes our cleaning service is not able to identify if something is stained/damaged as renters often wash and put away what they use, making it harder for us to identify that something has to be replaced. Avail. of a toaster, Hair Dryer, etc. There is a toaster oven and hand soap provided in every bathroom. Tissues and paper towels provided. We have extra in the pantry. It seems as one of the previous renters left HD in a diff location. We reimbursed the cost of a new HD to guest. Leak: We are located on the top of bluff and during storms the winds are extremely strong. During her stay, stormy weather with very strong winds blew off some of the shingles off the roof and heavy rain made its way in. The leak was fixed the day after it was reported. We absolutely loved staying here. We traveled from the Midwest to be close to our family in the area shortly after having a baby. Our family of 5 found the house to have ample space plus room for guests. The second living space with tv and table tennis on the lower level was great for the kids. We practically lived on the deck which was nicely refinished and painted. We used the grill most nights and watched the most amazing sunsets. I cannot say enough good things about the location and the view. The neighborhood is quiet and the small beach (much bigger during low tide) was perfect. We felt like we had our own private beach. We found the house in good condition. It felt cozy and lived in, but also well maintained. The kitchen is big, bright, and has a great table and island for a crowd. There is a skylight that opens. We barely used the air conditioning during the day because the breeze and airflow were so good. If I had to make any suggestions it would be to add a dehumidifier on the lower level and add a dresser to the bed rooms so guests can unpack a little easier. We stayed for 3 weeks so may have had more clothes and baby items than most people would bring. My kids' scooters got lots of use on the dead end street but the neighborhood is pretty hilly with some narrow streets so we didn't use our bikes at all. We could have left those at home. There is a lot to do in a short distance from the house. We went berry picking (close to the wineries) and the farms along the way to offer so much during the summer; Splish Splash water park; the quaint village of Greenport had something for everyone. Don't miss the tour of the fire boat there. We would have liked to take the ferry from Orient but had such a good time relaxing at home that we didn't get a chance. Lastly, Shay and his family are very friendly and attentive to the home. We hope to return! We loved having you and share the sunset views with your family. Hoping to see you back! My family and I stayed with another family here on a quick escape from the city. We had a really nice time. The house is set up perfectly for kids. My kids were excited to find plenty of toys to play with and everything felt really child friendly. The bunk beds and extra beds in the kid room were a nice bonus. We had a really nice beach day on the beach, which is about a 5 minute walk from the house. The view from the house is really spectacular, you almost feel like you are on a boat. We spent a lot of time just looking out onto the Long Island Sound. The working fireplace was perfect. The owner, Shay, was super friendly and easy to work with. I would highly recommend this house. One of our friends had an early morning flight out of LGA and was able to make it back to the city really quickly. Although you feel really far away from the hustle and bustle of New York City, you aren't too far out. We are family oriented and happy to have guests alike to return and enjoy our little piece of heaven and benefit from our fully equipped house for a relaxed vacation around the year. This house was exactly what we wanted and as described. Beautiful views of the water and other ample space for everyone to spread out. We came in with our two kids and in-laws and everyone had space to move around and lots of room to play and hang out. The owners were fantastic and super helpful and we can't wait to come back for another visit. We keep the house clean and simple to organize and move around. There are different places to hang out on the property should one want to keep privacy and quiet. 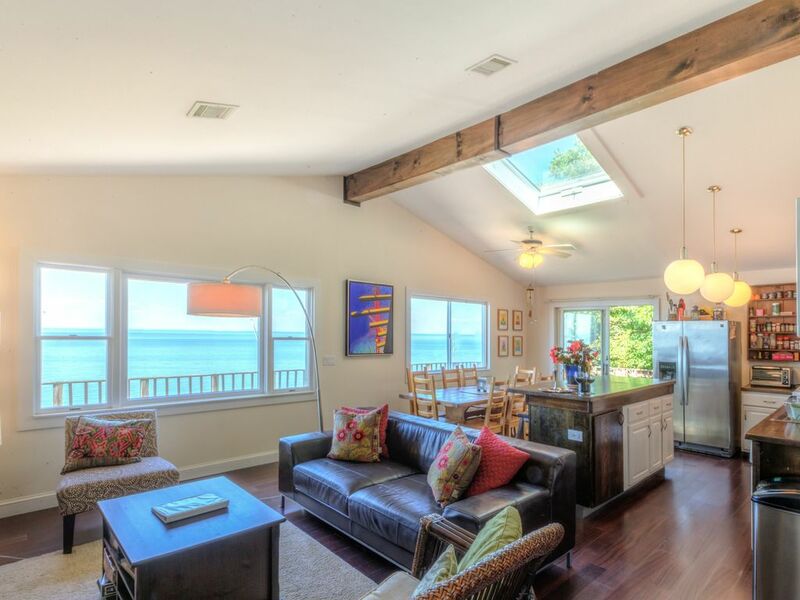 We had a fantastic time at this stunning home on the Sound! While the majority of our days were spent exploring the nearby wineries and beaches, when we were home, we were very relaxed and comfortable. The view off the balcony is simply breathtaking, and especially enjoyable in the morning with a nice cup of coffee. The house was exceptionally clean, welcoming, and spacious. I would highly recommend staying here! Happy to hear that you enjoyed it! Hoping to have you back. Minutes from Long Island Wineries, Golf Courses, Water Park, Farms, Atlantis Aquarium, Great Shopping at Tanger Outlet...and so many more activities close by. Weather you are coming to the area to visit family, attend a special event, decide to be close to NYC but not too far away, need a break to relax; Simply enjoy your stay in our house and the beautiful views of the beach and the Long Island Sound. Other Activities: Sailing, Kayaking, Ping Pong, Long Island Wineries. The 18-hole 'Willow Creek' course at the Willow Creek Golf and Country Club facility in Mount Sinai, New York features 6,611 yards of golf from the longest tees for a par of 71. The Willow Creek golf course opened in 2005. The 18-hole 'Port Jefferson' course at the Port Jefferson Country Club At Harbor Hills facility in Port Jefferson, New York features 6,763 yards of golf from the longest tees for a par of 72 . The course rating is 72.6 and it has a slope rating of 128. * There's additional $25 fee per night per adult for any additional adult over 6 a total of adults. Payment methods: Personal Check, Cashier's Check or Money Order, Pay Pal, Venmo (Credit Card Payments will be charged 3% of the total fee by the Credit Card Company and will be deducted from the Refundable Security (Damage) Deposit. • 3% Taxes are added to the total rent amount to any rental which is less than 30 consecutive days, as per Suffolk County Hotel / Motel Tax (Chapter 523-9). * Refundable Security Deposit of $1,000.00 is required with any reservation and must be paid at least 30 days before the first day of rental. • Credit Card Payment Fees (if paid with CC) charged will be applied and deducted from the Security (Damage) Deposit Refund. • Weekly rate includes one weekend only. Minimum 4 days reservation required during holidays or higher rate per day would apply. •Min. Reservation Deposit: 50% of the rent. • 50% balance AND Refundable Security Deposit of $1,000.00 are due at least 30 days prior to the first day of rental.